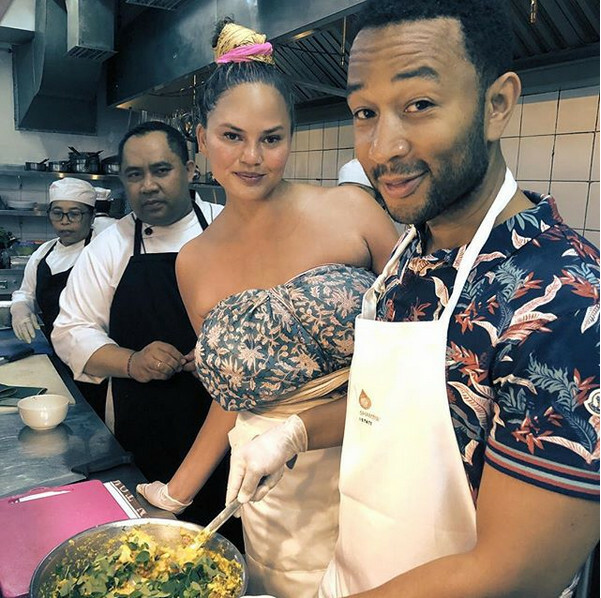 If you’re a devoted follower of John Legend/Chrissy Teigen’s Instagram stories, you probably have seen their enviable, long Bali holiday! Seen in the Island of Gods since last Thursday, they both regularly shared all the fun they had there. One of it the Balinese cooking class that’s just stroke a chord in our heart. John was wearing a casual polo shirt while Chrissy looking totally awesome in traditional cloth, as they prepared all the spices for cooking Sate Lilit. Their culinary experience continued with Pepes, followed by Bali’s signature Sambal Matah. Their togetherness made us melt, and we’re just curious, what are other things on their itinerary?